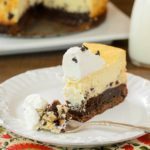 A recipe for a Brownie Chocolate Chip Cheesecake with layers of homemade triple chocolate brownie, creamy chocolate chip cheesecake, and whipped cream. Preheat oven to 350 degrees F. Grease the bottom only of a 9-inch springform pan. Stir together the chocolate chips and 1 tablespoon of the flour in a small bowl. Whisk together remaining flour and salt in a separate small bowl. Melt the chocolate and butter in a large non-reactive bowl over a pan of simmering water. When the chocolate and butter has melted, remove it from the heat and stir in sugar and cocoa powder. Whisk in the vanilla and eggs, one at a time, mixing well after each addition. Stir in flour until just moistened. Stir in chocolate chips. Spread batter evenly in prepared pan. Bake for 25 minutes, or until set. Beat cream cheese until fluffy. Add condensed milk and beat until smooth. Add eggs and vanilla and beat until just combined. Do not over beat. Bake 50 minutes or until center is set. Cool to room temperature. Chill thoroughly overnight. Beat whipping cream using a mixer on medium speed until frothy. Gradually add sugar while increasing mixer speed to high. Spread whipped cream over top of cheesecake. Time stated does not include chilling cheesecake overnight.